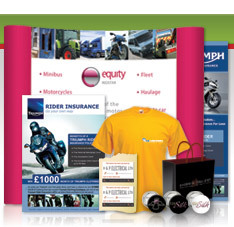 We can design any type of marketing including notepads, clothing, exhibition stands, corporate Christmas cards, posters, signage, rollerbanners, media adverts, calendars and more. If you have a vision in mind our team can make your vision a reality, alternatively if you're not too sure and need some help, our friendly team are on-hand to provide advice and assistance, as well as their creative ideas. Corporate Christmas Card Design... for any holiday or event, and will work closely with you to create a card which accurately reflects your brand and sends the right message to your customers. Media Advert Design... Our bespoke advert design service is tailored to your needs, and we work closely with you to gain an understanding of your key benefits and values to create a stunning advert, which increases visibility and is appropriate to your brand and core values. Whatever the style of publication or specification advert, our creative team have the experience required to produce results and exceed expectations. If you have a vision in mind our team can make your vision a reality. Alternatively, if you're not too sure and need some help, our friendly team are on-hand to provide advice and assistance, as well as their creative ideas. All design prices listed below are for design only, if you are ordering with printing you will receive a 50% discount on the design charge. If you require design of something not listed below please feel free to contact a member of our team and we can provide you with a bespoke quotation. 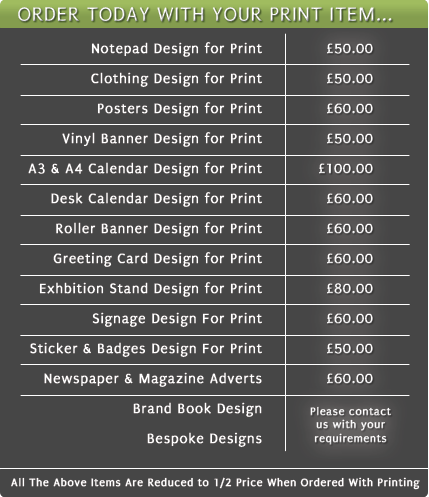 For printing prices on the above please feel free to visit Appletree Print by clicking the logo below... or Just give us a call or send an email. Your creative and corporate promotional designer will talk in-depth about your requirements, taking into account any ideas you may have. Your promotional designer will begin work on your promotional design and email you the promotional concept board within 48 hours. Once you have viewed the initial concept you may discuss any changes with your promotional designer and he/she will continue to revise your promotional design until you are happy (unlimited revisions). Once you have signed off the promotional design, your promotional designer will prepare for either print or send. If you have selected printing, your promotional will be printed and sent to you. If you have selected design only, your final promotional design will be prepared in high resolution print ready format and emailed to you.